No $150,000 wardrobe malfunctions for Michelle Obama. "Actually, this is a J. Crew ensemble," the wife of Democratic presidential candidate Barack Obama told comedian Jay Leno on Monday on his talk show. She wore a yellow sweater, skirt and blouse ensemble. "You can get some good stuff online," she added. Questioned by Leno, the potential first lady declined to criticize GOP vice presidential hopeful Sarah Palin about revelations that the Republican National Committee spent $150,000 at Neiman Marcus and other high-end retailers on clothes and accessories for Palin and her family. Obama said she and her husband have a policy of spending their own money on their clothes. But she said she wanted to be "empathetic." "A V.P. pick, it's like being shot out of a cannon. All of a sudden you're at the center of attention, and you want to look good," said Michelle Obama, adding she has never met Palin. "You're living in your home, minding your business, and all of a sudden you're on the national stage and everyone's watching." Leno asked about Barack Obama's ailing grandmother. Obama recently left the campaign trail to spend time in Hawaii with his grandmother, Madelyn Dunham, who virtually raised him and is his main remaining family. "She's doing OK, up and down. 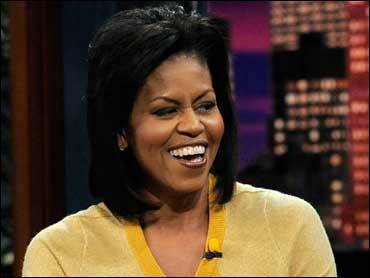 But we are just grateful that he took time off and went to see her," Michelle Obama said. She said her husband credited his grandmother, whom he calls "Toot," with teaching him strength. She said neither of Obama's two young daughters is overly excited by the campaign. Ten-year-old Malia's reaction to her father's plans to air a 30-minute paid advertisement on national TV Wednesday night? "'You're going to be on all the TV? Are you going to interrupt my TV?"' her mother said Malia asked. She said Barack Obama reassured his daughter that he hadn't bought time on the Disney Channel.